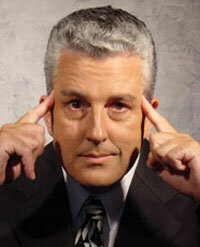 Corporate Mindreading Show. Mentalist Australia. Unique Interactive Comedy. Widely regarded as one of Australasia’s top mystery performers, Timothy Hyde will thrill, befuddle and highly entertain your guests with his stunning display of Sleight of Mind, Intuition and side-splitting Comedy. Its sophisticated fun and intriguing mystery combined into one amazing package. So what does a Mentalist actually do in his show? He reads people minds, reveals elements of their personality, displays amazing memory techniques and can duplicate a drawing made outside the room! This modern, sophisticated and highly interactive performance is always a hit with discerning audiences and will provide a great talking point at any event. Timothy claims no “special powers’, just years of performing to live audiences and the use of – Psychology, Body Language, Unique insights into Human Behaviour and Sleight of Mind to accomplish his amazing feats of Psychological Illusion. The shows are easy to stage with minimal requirements and setup time. Where possible he will incorporate Conference Themes, Products and Messages into the presentation. A masterful entertainer, he guarantees to provide a fast paced, sophisticated, trouble free presentation that will delight you, your guests and your clients.